2018 already! How did that happen? Happy New Year to you all. Thank you so much for all your support in 2017. We really did have an excellent year and it’s worth spending a few minutes having a look back and a little reminisce about some of the lovely lit happenings that the Big Bookend was involved with last year. 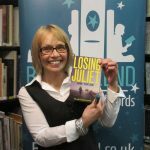 We started our year in style with the sell out launch of Losing Juliet by debut author June Taylor at the Leeds Library. June is a long term volunteer of the Big Bookend team and it was wonderful to see her getting a well deserved publishing deal from Harper Collins. There’s a second book in the offing too for 2018/2019 which June is busy writing now. 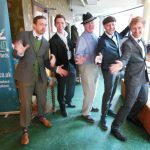 We beat those February blues with our Roaring Twenties Big Jazz Age Quiz set by writer and quiz master extraordinaire, Richard Smyth. We had fancy dress, jazz hands and everything. How Richard had time for all of this we really don’t know especially as he was about to publish the lovely A Sweet Wild Note. Congratulations to Richard also on winning a Northern Writers’ Award. In May we received the tremendous news that our Remembering Oluwale anthology had scooped first prize in the Anthology category of the Saboteur Awards 2017, against fierce competition. We are so proud of this. Its editor, SJ Bradley, has written about how a partnership effort made this happen which you can read about here. June is always a busy time for us and 2017 didn’t disappoint! We were delighted to help with the launch of debut novelist Clare Fisher’s All the Good Things which has been getting rave reviews all over the place including the Guardian. Clare has her first short story collection, How The Light Gets In, published by Influx Press this Summer. Our second Northern Short Story Festival was a great success. 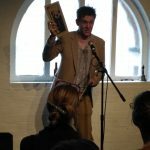 We had a small press panel event, workshops with Zoe Lambert, Sarah Dobbs, AJ Ashworth and Jhalak prize winner, Jacob Ross, a writers’ panel event, our first ever flash fiction slam and Leone Ross’ collection launch. 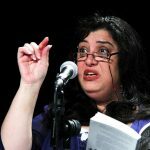 The good news is that the Northern Short Story Festival will be back on Saturday 2nd – Sunday 3rd June at the Carriageworks. Curated by the ever brilliant SJ Bradley, it’s a two day event this time around. It’s going to be bigger, better and brighter! If you would like to volunteer for it, we’re recruiting now! Sign up here. We also launched the Walter Swan Short Story Prize 2017-18. We had over 300 entries. The longlist and shortlist will be announced in February with a launch event for the resulting Anthology, published by Valley Press, on 22 May at the Leeds Library. More details to follow soon. 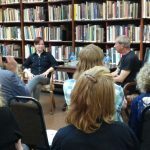 We wrapped up June with two historical fiction greats, Chris Nickson and Candace Robb, in conversation at the Leeds Library. What a treat it was to hear about their writing careers, literary passions and transatlantic friendship which started on Twitter! They will both have new books out this year which we are looking forward to enormously. 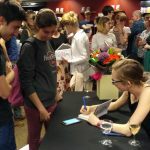 July was marked by the launch of SJ Bradley’s second novel, Guest. She tells it best here in her own blog post. 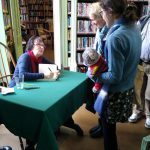 Suffice to say, Sarah never fails to amaze us with her talent and capacity to get involved in numerous literary projects and for whose support we are hugely grateful. We send Sarah our congratulations on being awarded a K Blundell Trust Award from the Society of Authors which will enable her to get writing her third novel. So gliding into Autumn, we were privileged to launch Frances Brody’s 9th Kate Shackleton mystery, Death in the Stars. 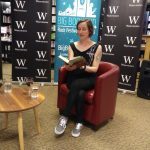 Another fantastic read from Frances who is quite simply a master story teller and who captivated her sell out audience, as she always does, at the Leeds Library. We were part of the Love Arts Festival too. Clare Fisher was in conversation about All the Good Things with Tom Bailey from Arts & Minds,Leeds. And our last event of the year was to help officially launch the Hyde Park Book Club’s Book Shop! We celebrated Yorkshire writers with a whole afternoon of glorious readings from some of our most talented word smiths. 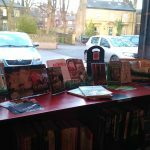 If you haven’t checked out the book shop yet then pop in, have a cuppa and browse the Yorkshire writers’ section in particular (highly recommended!) as well as the second hand books’ section. If you want to have a clear out of your shelves too, Jack Simpson will be happy to take them off your hands. Please contact him direct. Finally, we must mention Strix magazine, founded by its editors Ian Harker and Andrew Lambeth. It is an exciting new magazine of poetry and short fiction, based in Leeds. It’s already published 75 pieces of new writing in two gorgeous editions and is taking submissions for the third edition which will be published in March. Congratulations, Ian and Andrew, on an excellent publication. So there you have it, friends, our year in review. We’re looking forward to lots more literary fun in 2018. Dates for your diaries now are: Thursday 8th February – #FoundFiction launch party; Thursday 15th – Saturday 17th March – natural history writing events at the Leeds Library, celebrating their 250th anniversary; Tuesday 22nd May – launch of the Walter Swan Short Story Prize Anthology at the Leeds Library; Saturday 2nd – Sunday 3rd June – The Northern Short Story Festival at the Carriageworks Theatre. Thank you to everybody who supports us. We know we have amazing volunteers, friends and partners out there. It’s just brilliant to be part of the fantastic Leeds lit scene. Here’s to a very productive and creative 2018! Photos by Izzy Brittle and Fiona Gell. Follow the Leeds Big Bookend on Twitter/@BigBookend and Facebook/BigBookend and sign-up to our mailing list on this page.